Grace to all who love our Lord Jesus Christ with an undying love. What do you have that lasts forever? Not much unless it is connected to the Lord Jesus Christ. So many things we love and pursue are hollow, fleeting, shallow, and vain. But grace comes; grace stays; and grace lives with those whose love is the Lord Jesus Christ. Neither time nor the grave can strip away our grace in him when he is our Lord and he is our love. Holy God, I acknowledge that you loved me long before I knew anything about you. I confess that despite your overwhelming love for me, I have strayed from your will. But Father, deep within my heart I love you and thank you for sending your Son Jesus. His sacrifice and your mercy have not only given me hope, but they have given me confidence to face whatever lies ahead today. Please fill my heart with love for you and your Son by the power of your Holy Spirit. 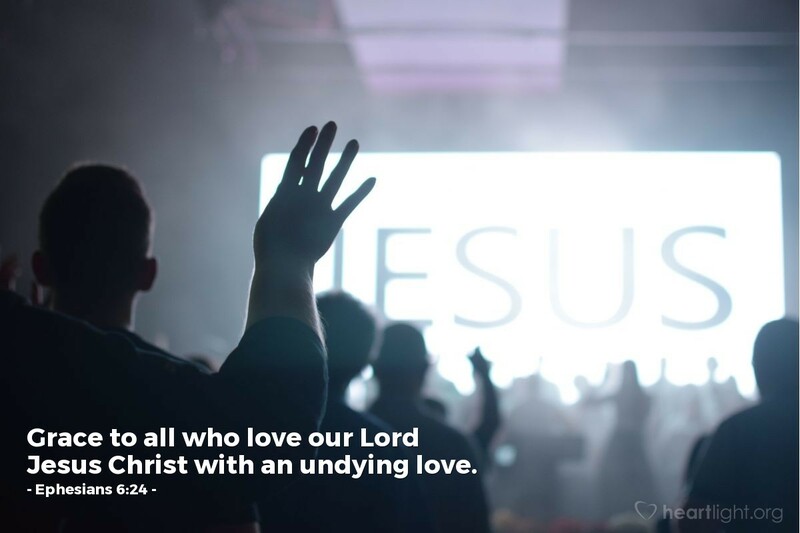 Dear Father, may my allegiance to you be as unwavering and undying as your love is for me. In Jesus' name I pray. Amen.